B2B Client On-Boarding For The "Age Of The Customer"
As Peter Drucker once commented, "The purpose of business is to create and keep a customer." No matter how great an enterprise’s mobile experience or re-constituted social media presence, a laser focus on creating and keeping happy customers is a requirement in the "Age of the Customer." So why do we “create” new customers so badly? To answer this question, this webinar divides the on-boarding process into eight phases in order to highlight significant on-boarding problems. Approaches that "lift" on-boarding functions out of product silos and into more accessible systems of engagement to help resolve problems related to complex exceptions & human workflow, end-to-end automation, and data integration are detailed. Case studies in financial services are highlighted. 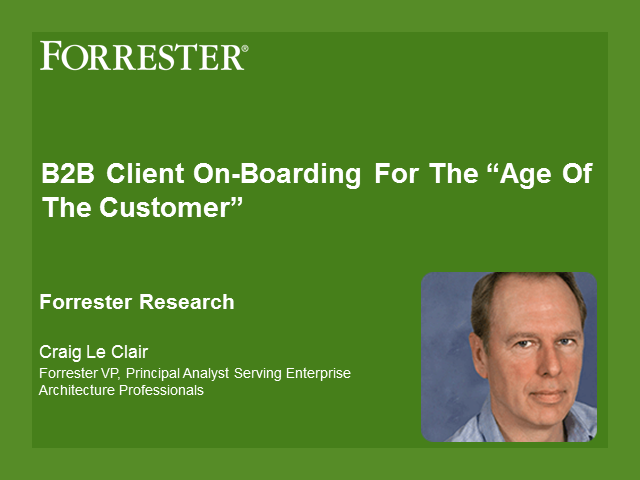 Title: B2B Client On-Boarding For The "Age Of The Customer"